The title of this miniature heralds a series of tensions for which Siegfried A. Fruhauf has found a new form: Still Dissolution measures the relationship between photography and film, standstill and motion, formation and dissolution, now and then, and material reality and illusion, and does so in an interplay of analogue and digital visual technologies. 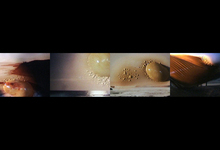 Four color prints from the holiday photo genre are filmed individually and arranged alongside one another on a split screen. Although the digital, high-resolution film recordings are subjected to a steady game of here again—gone again within a gently vibrating, increasingly pulsating, flickering composition, at the same time, this undermines the pictorial movement depicted in each of the individual fields, namely, the slow fading away of the photographic, pre-cinematic carrying material. In the melting process, unique, seemingly dynamic bubbles, blotches, and streaks emerge whose changing forms and colors gradually dissolve the photographed seaside landscapes. Appearing in the end are moving diagrams from a medical imaging process that shows the heartbeat in vivo. The film thereby re-surveys the artistic position of Hollis Frampton, who as “meta-historian,” assigned film to the machine era and associated the American avant-garde with its becoming obsolete in the radar era. More than forty years after Frampton’s Nostalgia, Fruhauf once again uses burning photographs to question the cinematographic structure of temporal processes. But he is less concerned with examining the relationship of word and image with which present and past are defined in film: all that can be heard in Still Dissolution is humming and rhythmic droning. The media archeological accent is now on the burning of the archive whose technical basis, as is known, determines the life of the images.